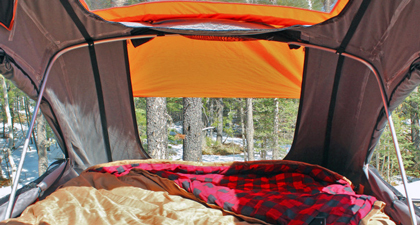 Treeline Outdoors elevates your camping. Literally. When it comes to camping, tents are tents. But a rooftop tent is a bed. That has benefits if you’re camping with your better half. No rolling up sleeping bags. No packing pillows. No worrying about rain. For all that: have a look at the Tamarack Constellation from the rooftop camping pioneers at Treeline Outdoors, shipping now. It’s like a treehouse for your car. A treehouse with a mattress, massive skylights and windows for days. 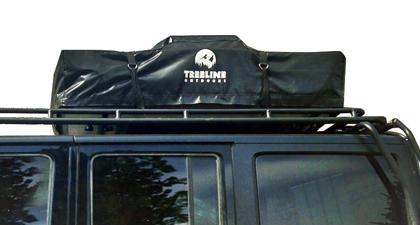 The whole thing folds into a tidy, weatherproof package that lives on your roof rack. And before you go getting all down in the mouth about the shortage of SUVs on your estate, it’s worth noting the Tamarack only needs 37 inches of bar to make your ride a home. So, you know, Subarus with load-bearing racks welcome. Throw in Treeline’s clever two-person sleeping bag and you’re good to go. No tent-pitching hassles. No rocks in your back.